When I began my Minneapolis wedding photographer business, I did not have a "home base" in which to meet clients, share images, show products, etc. A few years in, I realized I no longer enjoyed holding client meetings in poorly-lit coffee shops and loud restaurants. My shoulders were hurting from lugging around huge bags of wedding albums and wall art. Not to mention that I had never had a good indoor location for portrait sessions, image reveals or other meetings. It seemed that the time was right to begin looking for my own Minneapolis wedding photographers studio. Anyone who knows me would know that any decision I make is never taken lightly. I started by meeting and interviewing several studios around town who were looking for additional Minneapolis wedding photographers. 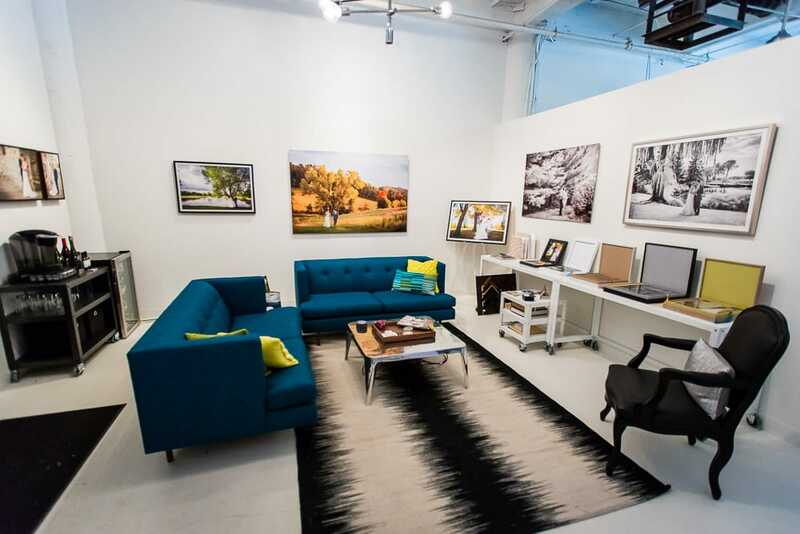 I then also started looking into options for renting my own studio. I found one that I loved at the Vandalia Tower building, located on Vandalia Street at the 94 exit in St Paul. The building was undergoing a major remodel, so at first glance it was not much to look at. But being a member of the First & First family (the group who owns and operates the gorgeous Aria event space in Minneapolis), I figured the building owners knew what they were doing. And they had great plans underway, including the recent opening of Lake Monster Brewing and the Paikka event space. So I started leasing my own studio in 2015 amongst the awesome artists and even a few other Minneapolis wedding photographers of Vandalia Tower. To say that I love my studio is an understatement. It's an awesome space, and I was lucky enough to have a friend help with the build out so we could customize the space to fit exactly how I wanted it. I started by polishing and coating the floors white. I divided the space into thirds for the variety of needs I had in my studio by adding a room to the middle of the space. The room is partly for my husband's painting studio, partly as a place for my hair/makeup artists to work with my clients, an partly as a client changing room. It's got a door so can be closed off the the rest when needed, as well as plenty of lighting, chairs, full-length mirror, etc. My much-needed front room is a meeting space, a show-room of Minneapolis wedding photographer product samples, and a space that I can hold Image Reveal Sessions projected directly on my wall. I love the modern aesthetic, airy feel, and focal wall art spaced around the room. While the room is full of samples and other items to look at, it does not feel packed or messy. 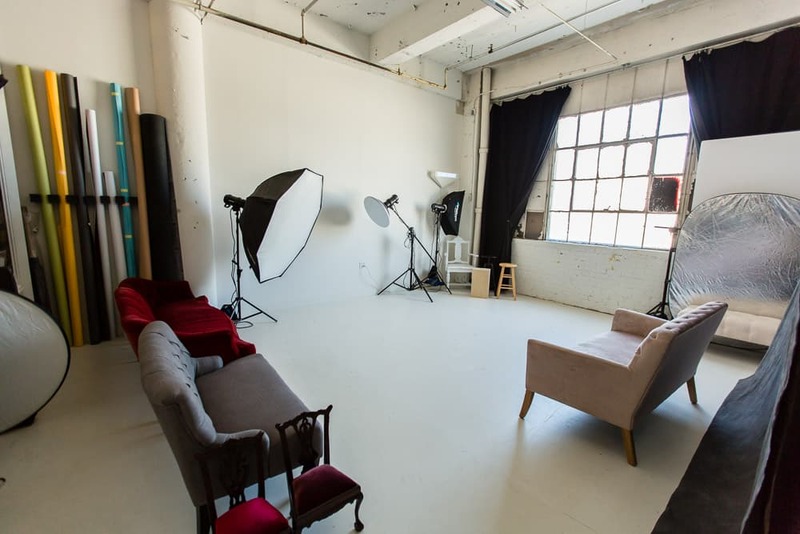 The back of my studio is the shooting area - I've got numerous backdrops, props and seating, all set against the gorgeous light coming from a huge set of warehouse windows in the back wall. I've also got full studio lighting and blackout curtains in case I need to control the light in a more detailed way. So I am lucky - I have the capabilities of being both a natural light studio as well as full control of studio strobes. I am so excited to share my Minneapolis wedding photographers studio with everyone. Please take a moment to let me know if you'd like to visit - I would love to meet with you to talk about your wedding day plans, photograph you, and/or show you your final images and my heirloom artwork samples in my Minneapolis wedding photographers studio soon. Take a look at these photos to see what you could expect when you come to visit!